In order to support the business, the global and mobile workface is changing the demands on IT. Besides, young workers are also changing the expectations on how IT delivers the data and the applications. During earlier times, Windows applications and user role were tethered to the desktop. However, it is pretty much challenging to manage these for a distributed workface with multiple computing devices. Therefore, in this new world, the collaboration like eLearning, remote applications and unified communications (like Instant Messaging and video conferencing) is transforming the way users work. Now-a-days, the security breaches have become the major concern and no matter what kind of end-point device is being used. In the year 2010, Ponemon Institute (in an Intel commissioned study) reported $6.4 million average annual cost for lost business laptops. In order to lower the desktop costs, most of the companies are following the Bring Your Own Device (or BYOD) strategy. Although, this concept may lower the costs of purchasing the desktops and the laptops, the challenges on the other side to manage the multi-OS devices require a new model that is capable of working for both the end users and IT. The upshot is that IT has to clinch desktop transformation for enabling the workers to access their data on and from many different devices anywhere and anytime. In such cases, the solution from HP and VMware really works out. If your Smartphone, tablet or laptop is lost or stolen, no company information will be exposed. Therefore, it will be a better option if you go with virtualization desktop with VMware vSphere and View rather struggling to meet the needs of new business paradigm with an older computer. VMware and HP bring this important move to the client virtualization safe and easy by delivering the tested solutions sized for specific work loads. By using the HP’s client virtualization solutions with VMware View, you can get a secure and end-to-end solution from the end point device to back-end datacenter infrastructure. The HP VirtualSystem CV2 with VMware View solution is delivered with pre-tested, pre-configured using HP Factory Express to save your time with assessment, design, ordering, configuring, installing and optimizing. Besides, HP Insight Control for VMware vCenter is an integrated management solution that proactively manages the changes with the detailed insight into the relationship between the physical and virtual infrastructure. HP and VMware understand all of the steps required to get to desktop transformation. 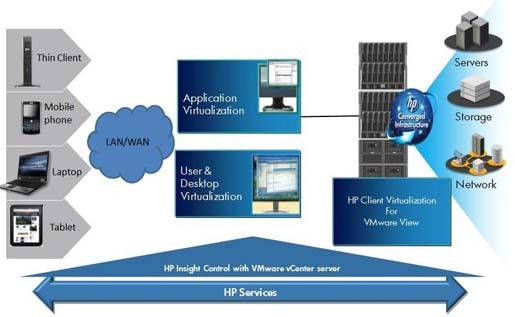 HP VirtualSystem CV2 with VMware View reduces the complexity of deploying client virtualization. Standardize on a common virtualization platform with VMware View, vSphere and HP industry-standard components and get from concept to production to value faster than ever before.